Why pay up to $350 a year or more for half as much local news? 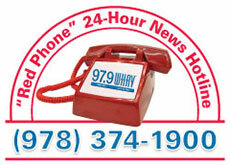 On air, online and in social media, 97.9 WHAV FM provides more Greater Haverhill news, more often than all other sources combined. Now, you can support objective, accurate, reliable and trustworthy local news at the same amount or less than others charge for monthly digital-only subscriptions. Existing members may upgrade to a News Match Premium Monthly Subscription by clicking here.